Our new RV shipped with a Bose Solo sound bar, which fits the small space rather well but leaves a lot to be desired as far as sound quality. I’m a huge fan of constant directivity speakers, and have put a lot of time and money into the 4Pi mains, 3Pi subs, and Crown amps for my living area. It’s a 2.2 setup which favors the fact that we listen to music more often than we watch TV, but fulfills both purposes nicely. A proper CD design and electronic room adjustments go a long way towards emulating surround sound. After living with this setup for several years, the Bose Solo in the RV doesn’t leave either of us satisfied. When redoing my home office last year, I picked up a set of JBL LSR305 mains and a JBL LSR310S subwoofer. They share a lot of design ideas with the Pi speakers in my living room, but are on a much smaller scale, and have built-in class D amplification. I chose them based on hours of research online, and firmly believe that they are the best bang for the buck in speakers for smaller rooms. They blow most speakers twice their price away in my opinion, after sampling many speakers at local hifi stores. That makes them a prime candidate for the RV because it’s a small(ish) room, needs small(ish) speakers, and I don’t want to spend too much or sacrifice sound quality. 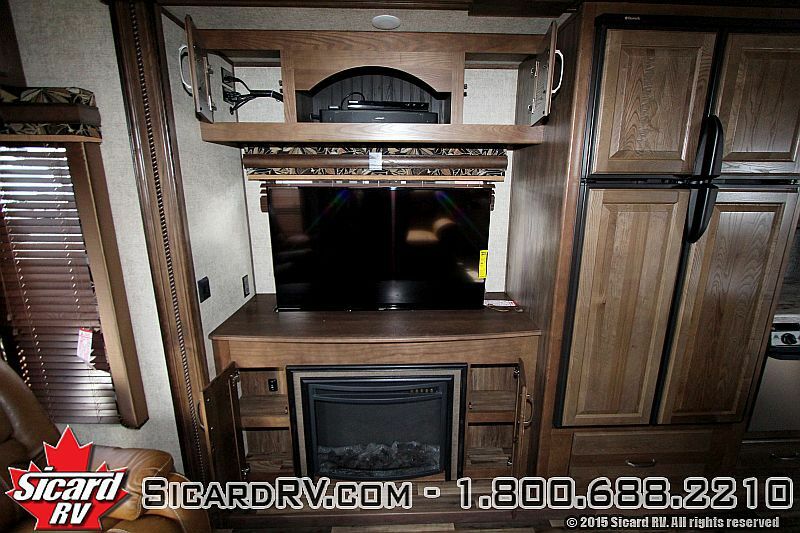 The 48″ TV measures 42.5″ across the top, and the entire console area is 57.5″ wide. That gives me 15″/2 or 7.5″ to work with. 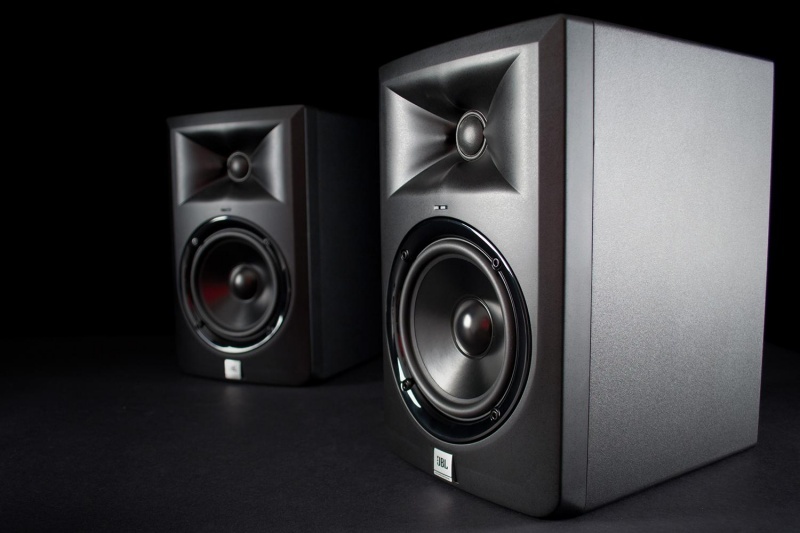 The JBL LSR305s are 7.28″, so they’ll clear the TV on both sides. The TV is on an electronic mount that drops down into the console to expose the window, so we can’t have anything sitting on the console itself. Instead, we must either wall mount or ceiling mount them from the above console. I chose to go with ceiling mounts that will suspend the 11.75″ tall speakers 6.5″ from the overhead console, and 14″ above the base since the distance between them is 32.25″. Moving to controls, I spent an awfully long time looking at low profile receiver and pre-amp options (need to be under 4.875″ to fit in the area the Bose sits) to power them, but could only find things in the $300+ range that weren’t exactly what I wanted. Then I realized that the TV has analog line out, that is volume controlled, and has two HDMI inputs for sources as well as the cable/antenna in. I opted to order an array of cables to connect everything together, including a wireless sub kit, that will allow me to move the sub out of the way. I finished the setup with a PS4 for gaming/ Netflix/ Hulu/ Spotify duties, a Roku Streaming Stick for HBO Now, and some cable management gear.